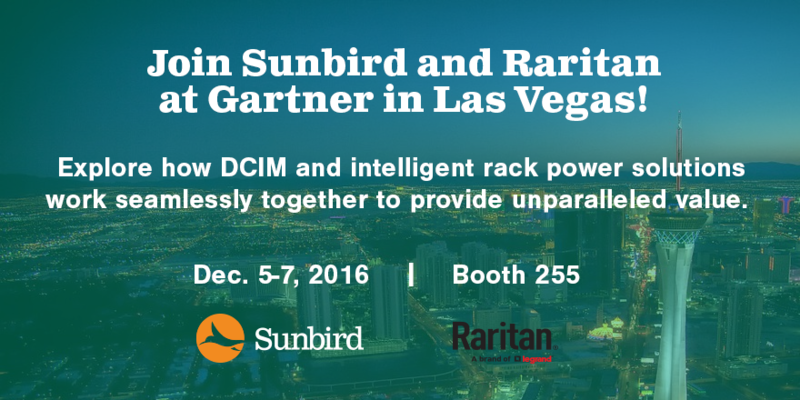 Sunbird is thrilled be participating with our strategic alliance partner Raritan, Inc. at the Gartner Data Center, Infrastructure & Operations Management Conference at the Sands Expo Center in Las Vegas, Nevada on December 5-7, 2016. Stop by Booth 255 to meet with our DCIM experts and get a sneak peek at the new features in the upcoming release of our Data Center Infrastructure Management (DCIM) software. The Gartner Data Center, Infrastructure & Operations Management Conference will help attendees learn to adapt to today’s complex data center environments. Attendees will discover how to apply a bimodal strategy that delivers both core services and enables agility, develop a "cloud-first" organization, transform I&O roles, skills, and culture for the digital business environment, and more! During the Gartner Data Center conference, Sunbird and Raritan will be demonstrating how DCIM software can truly add value to Raritan’s multiple, award-winning rack power solutions and make it easy to manage your data center environment today and into the future. Targeted at IT infrastructure and operations professionals in mobile, cloud, and virtualization environments managing servers, storage, and data center networking, the Gartner Data Center conference will highlight inspiring guest speakers, including Gartner analysts and end users. Additionally, the conference features comprehensive tracks to drill down on your hottest infrastructure and operations topics based on your role, experience level, industry, and key focus area. You won’t want to miss this event! Heading to the Gartner Data Center conference and want to chat one-on-one with a DCIM expert? Sunbird representatives will be available for individual meetings to help you explore if DCIM is right for you. Let us know if you’d like to meet for a personalized demo.